It’s made a huge difference to our system. Straight away we noticed a difference in the efficiency of our tech department once they were able to access files quicker. It was a step that was vital for the Supreme Court. We are glad we asked the advice of our Broadcast contractors. NMR and Cantemo came highly recommended, and it’s easy to see why. BEN HILSON, HEAD OF COMMUNICATIONS, THE SUPREME COURT. The Supreme Court, established in 2009, is the only court in the land to routinely film all the proceedings. This means that is has unending footage of the Justices at work. The Supreme Court upgraded its storage system to meet the demands of legal professionals and law students who requested footage so that it could be watched at their own convenience. This meant files had to be found manually. Because of the high demand for these files, the demand on engineers grew as well. It was recognised that the pre-existing system was outdated and required upgrading. After seeking advice from broadcast contractors, the Supreme Court concluded that NMR, a UK base media technology systems integrator, and its partners, including Cantemo®, was the best solution. We really had to get back into the market, to invest in something that was going to replace it [the previous system]. We were really impressed with NMR’s proposal for ToolsOnAir. With Cantemo Portal™ on top of that, we have easy access to all our files, even once they have been archived. ANDY WATSON, BROADCAST MANAGER, THE SUPREME COURT. 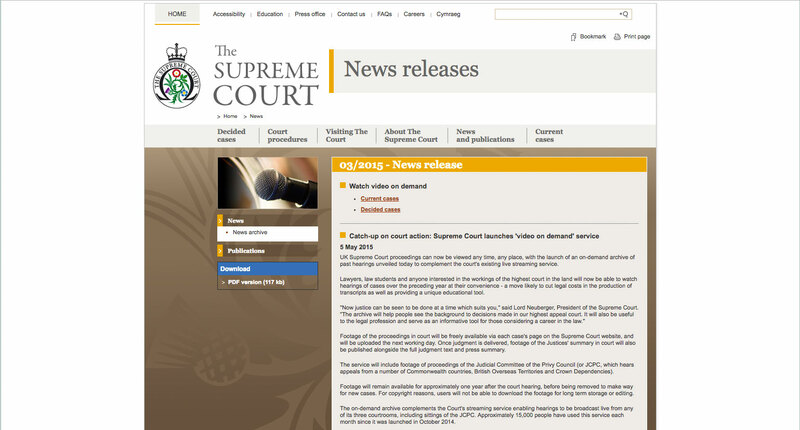 NMR supplied the Supreme Court with a faultless system that enables it to easily manage their unlimited amount of content. It includes Cantemo Portal, which utilises metadata to manage the storage of files, even once they are archived. Cantemo Portal allows us to add a significant amount of metadata to our files. Now this is not only useful for us if we’re trying to locate a particular video file. The data is really valuable when we transfer the assets off to the national archive for long term storage once it leaves our facility. It makes finding videos for legal enquiries much easier and less time consuming. The upgrading of the Supreme Court’s systems by NMR has alleviated the tough workload from its broadcast department. We were really pleased with the project delivery we’ve seen from NMR. In a very quick space of time we found that our engineers were able to work much more efficiently and turn around projects, but the integration very quick, very simple.